Yes, I said evil. But I don’t mean eyeglasses, really, I mean the whole field of modern eye-care — kinda like an bad witch doctor. Kinda. Well, maybe there’s more to the story than that. And yes, I’m being hyperbolic. I don’t mean it. Not really “evil” anyway, but maybe not the wonderful, unquestionable “good” that many of us think. Anyway, it’s something to consider…stick with me for a moment while I make a case. First of all, I need to be honest about the fact that I’ve been having a bad day. I had one of those “stuck in traffic” moments while going to get new glasses this morning that led to a minor “road rage” moment. Thankfully, I remembered to breathe and simply walked out of the clinic without even uttering a single unkind word. I mean, it’s not their fault. Somebody made a law. 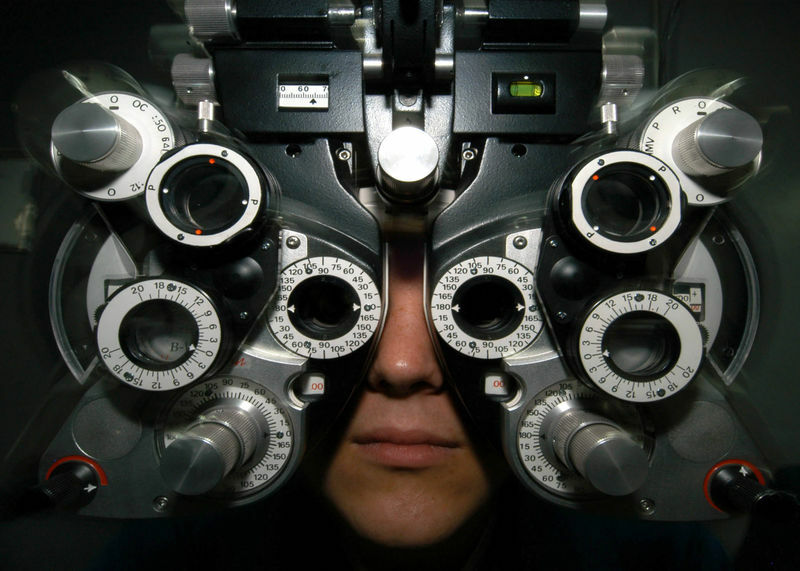 By Federal law, eye prescriptions expire in just one year. I didn’t know that. All I knew was that I had a perfectly good, hard won prescription in my pocket from three years ago. I say “hard won” because last time I went for an eye exam they took me to a darkened room, dilated my pupils, stuck my head in a vice, shined bright lights in my eyes and puffed air on my eyeballs. It was a miserable two hours. My eyes watered and hurt, and I had a headache the rest of the day. They did all this in order to tell me my vision was about the same as it was last time I got an eye exam…ten years earlier. I vowed I’d wait at least another ten years before I went through that again. Then my glasses got so the world didn’t look so good through them. The little scratches built up and I switched to my backup pair. Then two days later, I accidentally broke those. Now there I was with two messed up sets of glasses, hoping to simply walk in and get new lenses, and I’m being told to shell out another $200 and go to the torture chamber again. Ok, so maybe I have sensitive eyes. Call me a wus if you want to. Doesn’t matter. Government says I need another eye exam. And the opticians — the experts who make the glasses — aren’t gonna disagree. They’re probably the ones who lobbied to have the law made in the first place. After all, it brings them more business. Which might not bother me if I actually believed the central myth of our culture: that nature is broken. Including us. Poor vision, we’re told, is genetic. And so most humans just naturally need glasses. If it weren’t for the wonders of modern eye-care, we’d be poor blind cavemen…until we starved to death, of course. Dramatic proof that myopia is usually not inherited came from a 1968 investigation by Dr. Frances Young, who led a research team to Alaska to study Eskimo families that were being assimilated into the modern American lifestyle. This provided a unique opportunity to test the genetic theory because the parents were illiterate whereas their children were the first generation to go through school. According to the genetic theory, the parents and the children should have almost identical visual systems with little or no myopia. What Dr. Young discovered stunned the eye care profession. Only 2 out of 130 parents were myopic and the amount of myopia was very small. 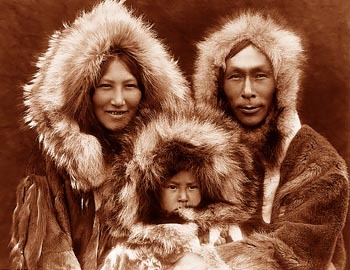 This was expected because they were living the traditional Eskimo lifestyle of hunting and fishing. In contrast, more than 60% of the children had measurable amounts of myopia! The children obviously didn’t inherit the myopia so Dr. Young concluded that the myopia was caused by long periods of reading as the children went through school. Francis A. Young et al, “The Transmission of Refractive Errors within Eskimo Fainilies”, American Journal of Optometry and Archives of the American Academy of Optometry 46, no.9 (September, 1969). Think about it. Our ancestors were hunters. How long are half-blind hunters gonna survive? In other words, what could possibly be the evolutionary mechanism for a hunting population to develop high incidents of myopia? There is none. It’s an absurd hypothesis that poor vision is “just genetic”. My view is that, generally speaking, poor vision is a disease of civilization. Mostly linked to living in boxes under artificial light and reading lots of written words. It’s probably also fostered by poor diet. And I have a hunch that it may even be linked to psychological factors — that perhaps cause some of us to loose interest in seeing the world. If that’s true, then folks in the eye-care profession are making a living (and a good living at that) treating symptoms without addressing their causes. Of course, doing otherwise might put them out of business. And big money is never made treating causes — not when treating symptoms will keep us coming back for more. But obviously it’s not the optician’s fault. I’m not blaming him personally. The whole thing is bigger than him. We’re talking about society and ecology here. Still, individuals play their part, and the experience of it all is pretty much the same as being under the power of an evil witch doctor. Our culture raises us to go blind, then tells us how lucky we are to have the privilege of paying someone to make us glasses. Personally, I’d rather grow up seeing the world. And in more ways than one. As someone who also suffers from road rage (brought on by other humans being on the road and not getting out of my way!) as well as poor vision for most of my life (I had that lasix surgery done a while back), and an avid reader and educator, I suppose you’re correct! all that edumication is bad for us 🙂 hahaha!!! great post! Ha! One over-educated eye-glass-wearer to another…thanks for the comment Marlon! A right-on exposé—only I had to get my bifocals out to read it. I think our blindness is a fitting metaphor for the whole medley of quaint afflictions that tagged along with our exodus from the wild. A suggestion: outsource to China. The kids there will fill your prescription, old or new, with the frames of your choice, for around $25 including shipping. 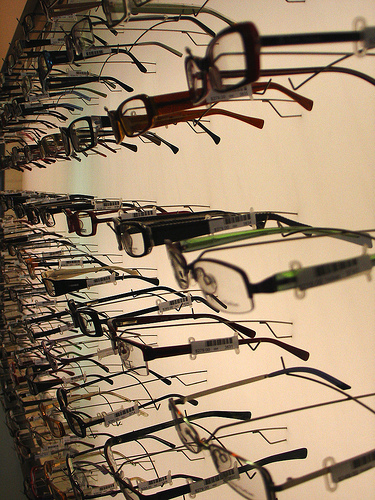 It’s where we get our glasses, and we feel good knowing that we are contributing to the global economy. Now back to finishing that book. Don’t worry—it’ll be available in large print and audio additions. Nice points. I also have nearsightedness, which made me cry when I found out at age 12. I’ve kind of stocked up on those $25 glasses in case those go away, but also wonder if vision could come back if returning to HG. I have a buddy who improved his vision a good bit while living in the woods for a year, he was using eye exercises in addition to living outside. Got his eyes from 20/400 down to about 20/100 if I remember right. I enjoyed your post. Thank you for taking the time to share. Oh wow, don’t get me started on the moronic regulations that milk us dry every day. Their absurd requirements “for our safety” are so transparently profit-driven, and yet we all, me included, plod on day after day going along with their rot. Suffice it to say, I feel ya, dude. Thanks Steve and Elena…nice to hear from each of you. It’s always good to know I’m not alone when it comes to this stuff. Have you ever heard of the Bates Method? is a great resource on this exact topic. I’ve heard of it, but haven’t tried it yet. Thanks for the link nick. Glenn my friend! I feel infinite gratitude for your synchronistic visit to our cave, & for your wisdom! Our wandering friends, Benjamin, Yasmin, & Marisa left a couple days ago. I just found your blog & randomly clicked on this excellent article. I proved for myself that what you are saying here is true. When I was a health worker in a small Ecuadorean village high in the Andes, in the Peace Corps in the late 80s, I gave presentations in the schools in my village, and I saw that nobody had glasses and assumed that a set statistical number of students couldn’t see the blackboard, as is the case in all developed countries. So I decided to examine all their eyes. I tested all the students (about 100 of them) from 1st to 7th grade. I was astounded that all but 1 had perfect vision, and not a single one had myopia! And that one student that had poor vision had a genetic macular disorder, and didn’t need glasses for myopia, but shaded glasses for light sensitivity. This was one of my many experiences in Ecuador that got me questioning the foundations of our civilization. Then I remembered when I needed glasses in 9th grade. As a child, I remember reading in school, looking up at the board, noticing everything was blurry at first. Then when my eyes adjusted, things became clear. The longer I read, the longer it took for them to adjust. Then, one day, when my body was fast growing, I looked up and my eyes would no longer adjust. They had become stuck! So I had to get glasses. I love the quote from Lame Deer! Keep your light shining, brother! Hey Suelo! It was great meeting you guys as well! A pleasure, for sure. I look forward to our paths possibly crossing again sometime. And I very much hope your light continues to shine strong! Thank you for the warm welcome and for all your hospitality. And thank you for sharing your perspective on this topic from your own experience in Ecuador…that’s amazing. I wish more such studies could be done, and documented, of course. Very important stuff. It just amazes me that our culture can be so unbalanced as to raise the majority of it’s children to be half-blind and with rotting teeth (I’ll be writing about that at some point as well!) and think that’s ok — not only “ok”, but basically “nature’s fault”. Yeah, crazy stuff.